Online consignment shop thredUP is launching a timely new feature called Groups, which allows consumers to use the service in order to generate cash donations for charitable causes. As you may have guessed, the company is kicking off the launch with a group dedicated to Hurricane Sandy relief. The company explains to me that while many people are motivated to donate food or clothing in the wake of a disaster, most relief efforts require money more than anything else. And while some people may want to help a cause, not everyone has enough cash on hand to really make an impact. ThredUP’s Groups offers them an alternative by allowing users to sell stuff lying around the house online – in this case, used kids’ clothes – and then have the proceeds from the sale donated to a charitable organization. 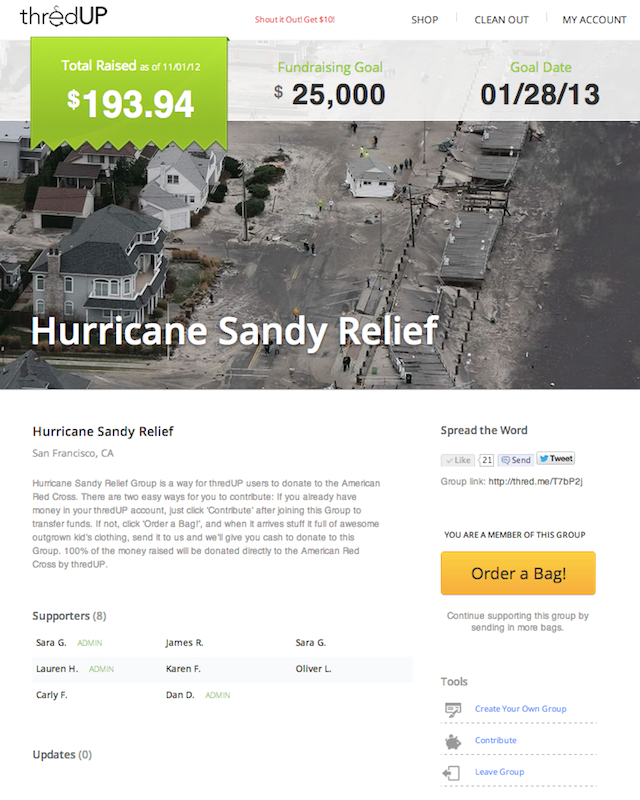 For the Hurricane Sandy Relief Group, users donate their proceeds to the group, and thredUP says it will give 100 percent of those donations to the Red Cross. To access the new feature (in beta), users go to the Group’s page, join the group, then request a “clean out” bag with prepaid postage. Generally, the bag requires a small deposit which is refunded upon return, but for this cause, that deposit is being waived. Once the bag arrives, you just fill it with consignment-quality kids’ clothes and return it. For every item sold from these donations, thredUP pays users, who can then donate their earnings back to the Red Cross group. Going forward, other organizations can use Groups to fundraise, and the recipient organization doesn’t have to be a national charity – local groups can use the same service to raise money for their own initiatives as well. Next year, the company will expand into junior, maternity and adult clothing, which will make the fundraising feature more accessible for more users. This feature, of course, benefits thredUP in terms of exposure and available inventory, which helps the business expand its customer base, but it’s not entirely motivated by self interest. ThredUP co-founder and CEO James Reinhart says he’s originally from New Jersey and spent his summers at the Jersey Shore. “This one hits close to home,” he says of the fallout from Hurricane Sandy. Groups had been in development for some time, but the team pushed up the launch in order to participate in relief efforts, he adds. Interested users can sign up here to help the Red Cross, or create their own beta group here.